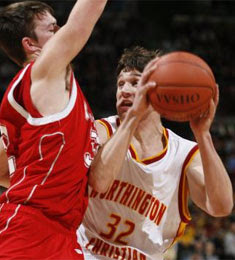 A trip to the Ohio Division IV Boys Basketball Finals capped the season for the Worthington Christian Warriors. However, their opponents, undefeated New Knoxville, proved too much. New Knoxville won the Saturday night game, 74-52, in front of 14,117 people in Ohio State’s Value City Arena. Worthington Christian High School is a ministry of the Grace Brethren Church of Columbus. To see complete coverage of the game, click here. Photo at right: Worthington Christian’s Brady Beals, right, looks for an open teammate as New Knoxville’s Brad Piehl applies pressure.